Teachers know what perfect storms in our profession look like. When you’re a teacher, the colloquialism “when it rains it pours” just isn’t enough. When it rains, we feel like we’re antediluvian Noah – minus the ark. Often, the only way out of the flood is the feeling after a great lesson has seen its implementation. These past 10 school days have been my perfect storm. My son was home sick the day before a test, so I had to stay up late night and write sub plans for a Plan B. Twice. Writing sub plans takes me, at a minimum, an hour; sorry, we don’t just “pop-in movies” anymore, edu-haters. My wife, 7-months’ pregnant, has been battling a weeks’ long cold herself, so I’ve been trying to help her. As for me – aka “germ incubator #2501” – well, I always seem to be fighting something. It should be no surprise educators’ immune systems are so suppressed – we’re cramming so much into any given day. My largest time commitment has been teaching a new curriculum and grade this year. While I’m enjoying the re-invigoration and rekindling of my passion for the profession, it requires plenty of new planning. I’m starting to empathize with my advice for new teachers: “your first year, a newbie teaches to survive; year 2 is for you; year 3 is for a lifetime” – because I feel like a newbie once again. After that, there’s plenty to busy myself with outside of class. I’ve been working on my National Board certificate and all the silly hoop-jumping involved in that program (that’s another future reflective article). In giving back, I’m serving as call committee chair to find a new pastor for my church. In trying to put social studies in action, I was elected judge of my precinct, and, of course, primary election day is a mere week before my wife’s due date. Let’s not forget — these Educator’s Room articles don’t write themselves. I was planning (and lesson planning) to travel to a conference in Berlin on March 21st; like most things in the Bo-Wash corridor, it was canceled because of the Four’easter. I’ve also been planning for future units, as I’ll take some paternity time to be home with my +1 family. I’m also The plan to plod ahead has not been an easy one. Most of all, I have very high expectations for myself and my lessons. If my students don’t understand – or express a dislike or disinterest in – one of my lessons, I’m just as motivated as any of our readers to correct and improve on that. Immediately. Coupled with grading papers, answering emails, completing forms and surveys, maintaining a semblance of sanity and trying to be a half-decent parent and husband, this job makes for some tough choices. Do I stay an extra hour to work on this lesson or go home and play Batman with my kid? Or do I do both and stay up until Midnight? Sometimes it seems like teachers can never win when it comes to improvement. Planning for school is hard. If the road to hell is paved with exhaustion, well, then most of us are on the fast track. This is no competition to say who has the “toughest job of all.” Many professions have challenges inside and outside of work. But I can only speak for my profession, and, when I do, I notice we teachers are often on the clock – or, in some cases, always expected to be. As for colleagues of mine, they are just as – if not more – busy. 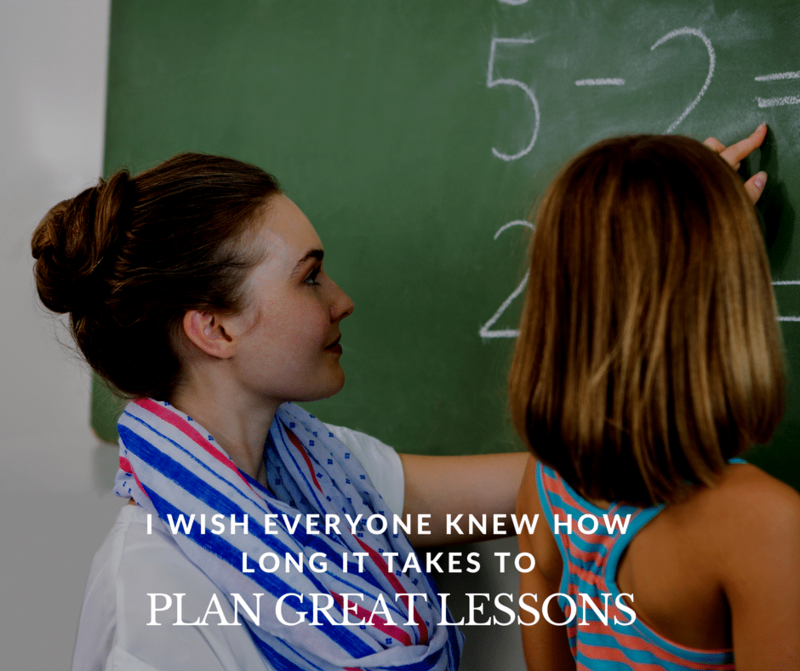 Elementary teachers are required to craft memorable lessons in so many curriculum that connect with students who vary in their levels. They have to be basic enough to connect to prior knowledge by challenging enough to keep the same kids interested – for the next 7 hours. I couldn’t imagine what it’d be like to be responsible for a child’s ability to read and have them not succeed at it. High school teachers have seen more students and classes added to their rosters. Coupled with increasing demands to solve our nation’s “testing problem” and “skills gap” by teaching them more challenging, college-ready lessons, well, there’s plenty of high school teachers experiencing burnout or, worse yet, a post-mortem. The changing rigor of education is pretty time intensive as well. There are currently two buzz terms most in our profession seem to be talking about. The first is “personalized learning” (click here for a great article from TER’s George Casutto), which involves meeting students at their abilities and interests. The other is “job-ready skills,” which requires us to move from information-driven curriculum to programmatic, skills-assessing rewrites (click here for a roundabout on JBS by the National School Board Association). While they’re both great goals and theories, the action – and planning time – to accomplish them just isn’t present in contemporary American classrooms. Theorists who put their dreams into action are often given plenty of time to think, write, and experiment. Me? Hell, I hardly have the time to use the bathroom, make a few copies, get the mail, and clear my inbox in a 40-minute planning period. And that’s assuming I don’t get pulled to cover someone else’s class because we’re short on substitute teachers that day. One of the biggest difficulties in teaching students is we’re losing our competitive edge for their attention. In the not-so-distant past, teachers simply had to compete with a dozen television stations and the written word, namely in books, periodicals, and notes kids passed one another. Today, teachers have to compete with many, often addicting, distractions. While it’s great that students can tune into YouTube and learn just about anything on their own, they’re mostly piddling their free time away. For many, especially girls, phone usage and social media are black holes of time; for others, especially boys, it’s not just hours on end of video games, but watching YouTubers play them. In fact, the Today Show reports a Common Sense media finding that “tweens” aged 8-12 are spending an average of 6 hours a day on media consumption, while teens are up to 9 hours. I’ve found students are prioritizing 3am wake-ups to check SnapChat messages or begin playing Fortnite before school. Many of them are shrugging off their school work until the last minute – some just shrug it off indefinitely. To engage kids, teachers feel their lesson plans need to be that good – something we can sell tickets to. Every. Single. Day. But that’s a nearly impossible feat. How do we get kids to sit and read for 30 minutes – a skill they’ll need for testing and in the work place – when they can’t focus beyond these distractions? If there’s a solution, it’s as simple as finding more time for teachers to generate lessons while they’re “on the clock” or to set aside “office hours” to meet with students in need. In fact, according to a 2010 Stanford Opportunity Policy study, American educators have 20% more direct instruction than the average nation. The Atlantic, meanwhile, reports that the two countries with whom we have the most envy (Finland and Singapore), spend 18 and 17 hours a week in direct instruction. For comparison’s sake, American teachers spend 27.5 hours at the front of the classroom. Yet we live in a society that often thinks teachers will take the easy way out, or, worse yet, work a part-time job (that’s at least what the Pennsylvania Senate Education Committee Chair thinks). That cultural shift isn’t about to happen anytime soon. So, for now, at least, I simply hope non-educators empathize with what it’s like to try and plan great lessons and bring an A-Game every day. Let’s just call it an education. As for now, I’m willing to try and save kids and curriculum – by loading them by pairs in my boat – as fast as I can. If any decision maker would like to give me more time to plan how and to implement that plan, I’d be all the more grateful.